Statement of Jacqueline A. Maffucci, Ph.D.
On behalf of Iraq and Afghanistan Veterans of America (IAVA) and our nearly 400,000 members and supporters, I would like to extend our gratitude for the opportunity to share our views and recommendations regarding prescription management and the potential risk of veteran suicide. In 2014 IAVA launched its Campaign to Combat Suicide. In February of this year, with your help we celebrated the signing of the Clay Hunt SAV Act into law. This was a first step on a long road to address the challenges of combating suicide among our service members and veterans. The issue that we have been invited to talk about today is a complex one because it encompasses two topics: providing care for veterans who are seeking relief from chronic pain and other conditions, and recognizing that there is potential for misuse of these powerful drugs intended to provide relief. And while these drugs are extremely powerful, they can also be extremely effective for a veteran who has not found relief elsewhere. According to a 2011 Institute of Medicine report, chronic pain affects approximately 100 million American adults and this number is growing. Given the last 14 years of conflict and the very physical daily demands on our troops, we’ve seen a similar trend among service members and veterans. Over 60 percent of the OEF/OIF veterans seeking VA medical care seek care for musculoskeletal ailments and this is the most common category for disability compensation. Within IAVA’s own community, two out of three respondents to our member survey reported experiencing chronic pain as a result of their service. Additionally, one in five were using prescribed opioid medications. Among this newest generation of veterans, medical advancements have allowed for higher survival rates from complex injuries, but this also increases the likelihood for lifelong impacts of nerve and skeletal damage. Treatment of pain in these instances can be even more complex, because co-occurrence with other conditions, such as depression, anxiety, PTSD, or TBI may limit treatment options for the veteran. For clinicians, assessing pain and devising a management strategy can be very difficult as well, particularly given that this is a relatively new area of focus in the clinical research field. Related to this, the primary care physicians, who see the bulk of patients with chronic pain, have repeatedly reported that they feel underprepared to treat these patients due to a lack of training. In a 2013 study specific to VHA, this was echoed by the VHA providers surveyed. Adding to the challenge are studies showing that untreated pain can actually put an individual at higher risk for suicide, and yet we also know that prescription medications can provide a means for suicide attempts, with over half of all non-fatal suicide events among veterans resulting from overdose or intentional poisoning. This highlights the challenges that clinicians face every day when treating patients with complex injuries that might include physical and psychological ailments. It also demonstrates the importance of comprehensive, integrated pain management for military and veteran medical care. The VA and DoD have both invested in moving the needle forward in this area, investing in research on pain and pain management, publishing an evidence-based Clinical Practice Guideline, implementing an opioid safety initiative, and introducing a stepped-case management system where primary care physicians have the support of an integrated, multi-disciplinary team of providers to design and implement a comprehensive treatment plan for the patient. However, there is certainly room for improvement. With approximately 22 veterans dying by suicide every day, and more attempting suicide, reducing instances of overmedication and limiting access to powerful prescription medications that can be used to intentionally overdose must be included in a comprehensive approach to addressing the issue. A recent study showed that while patients receiving opioid therapy are at an increased risk for attempting suicide, following some of the critical care guidelines recommended in the VA/DoD Clinical Practice Guideline for the Management of Opioid Therapy for Chronic Pain reduced this risk significantly. This shows the critical need not only for policies and guidelines, but full implementation of those guidelines. VA’s 2009 Directive on Pain Management, which outlines the stepped care approach to pain management, expired in October 2014. While IAVA understands that it expired in date only and the policy remains active, we are also extremely discouraged that the update to this important policy has not been prioritized and the new policy is still pending. We urge the VA to prioritize this to insure that the guidance provided by this important policy is not lost. Once reinstated, the challenge remains to uniformly and effectively implement this guidance at all VA facilities. IAVA also would like to emphasize the importance of minimizing the risk of overdose and over-medication through the creation of formulary take-back programs and the use of state prescription monitoring programs within the VA.
Last year, a change to DEA regulation expanded the authorization for drug drop-off sites to pharmacies, hospitals, clinics and other authorized collectors. This important change in law gave VA and DoD the ability to stand up formulary take back programs in their hospitals. This is a critical mechanism for means control, removing unused prescriptions from the general populations to limit the possibility of misuse and abuse, and yet, no action has been made to move this forward. While the VA is working to fully implement its participation in state prescription drug monitoring programs, IAVA urges the VA to move faster. Full implementation is critical to increase visibility across VA and non-VA clinicians so that they can be more informed as they work with their patients to provide safe and effective care. Too often we hear the stories of veterans who are prescribed what seems like an assortment of anti-psychotic drugs and/or opioids with very little oversight or follow-up. On the flip side, there are also stories of veterans with enormous pain and doctors who won’t consider their requests for stronger medication to manage the pain. These are tough challenges and IAVA remains committed to working with the VA and Congress to address them. As Research Director, Jackie closely tracks the latest information and emerging trends in the veteran’s space, developing a range of informational reports to bring attention to veteran’s issues across sectors and inform our policy positions and priorities. Jackie holds a Bachelor of Science from Cornell University and a Doctorate of Philosophy in Neuroscience from The University of Texas at Austin. 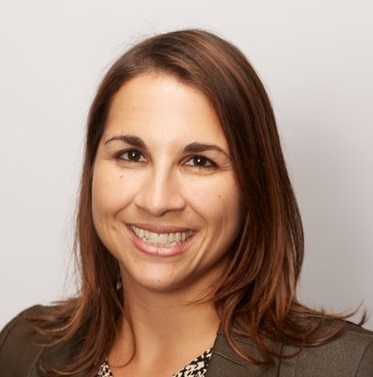 Prior to her position at IAVA, Jackie spent nearly four years as a consultant for the Pentagon focusing on behavioral health policy for the Army. This included over two years spent on the Army Suicide Prevention Task Force. Among other responsibilities, she acted as the liaison to the Department of Defense research community working to translate research into policy. Additionally, she was Editor in Chief for The Journal of Washington Academy of Sciences from 2010-2013. 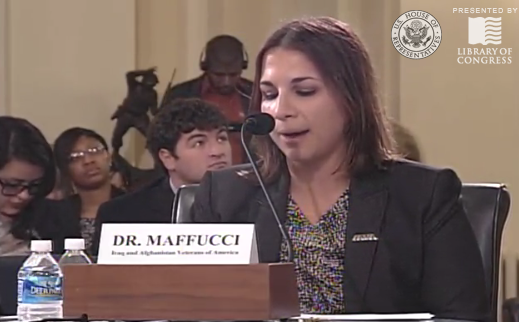 Neither Ms. Maffucci nor the organization she represents, Iraq and Afghanistan Veterans of America, has received federal grant or contract funds relevant to the subject matter of this testimony during the current or past two fiscal years.